My cousin, Rebecca is a certified Yoga teacher. She loves Yoga and truely embodies the spirituality of it. 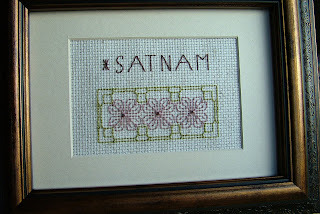 "Sat Nam" means "I am Truth", I embroidered this small pattern for her and framed it in a 5x7 frame. She can either place it on her desk or hang it on a wall. The pattern comes from part of a royalty free design I pulled from dunmanidesigns.co.uk. Rebecca loves anything that comes from the heart, this should brighten her week. 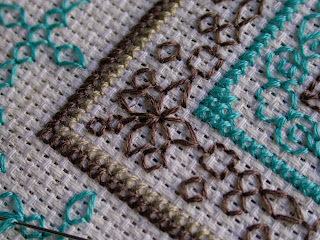 I am working on a black work piece using my "free" embroidery floss that I received from my sister's mother-in-law. I'm excited because I chose the colors based on the fact that I just wanted to try them. It was something different. I don't really have much in my house that is turquoise, so I'm not really sure where I will display it when it is complete. But I am really enjoying stitching it. I'm stitching on 14 count Aida. 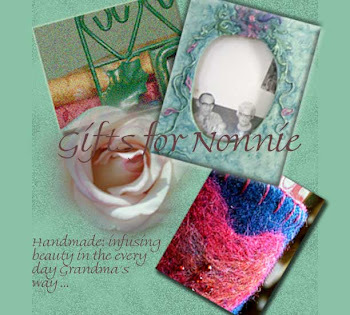 I did try this on 32 count cashel linen but the eye strain was killing me and my stitching suffered considerably. So, until I get more practice, I will be doing black work on Aida fabric! Alexa's third birthday was this past Saturday. 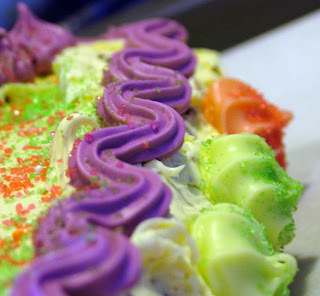 The little diva that she is, she wanted a birthday cake with lots of "sparkles". She wanted a Barbie princess cake. I did not get a picture of the whole cake (to wrapped up in playing host to take a picture! ), but I did get this shot of all of the sparkles. There was also a tiera on this cake that was topped off with three pink sparkly cupcakes. My father was taking all kinds of pictures, if he has one of the whole cake I will be sure to post it. 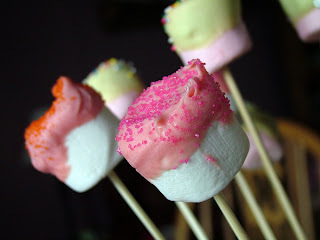 The marshmellow skewers were something different. I usually make cookie lollipops but I saw these on Kristen's blog at graceviolet.blogspot.com. They just looked too good to pass up and they were so easy to make! 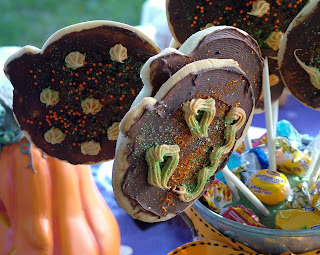 The kids loved them and I think they actually had less sugar in them than the cookie lollipops. I don't claim to be a cake decorator by far, but my girls always seem to love their birthday cakes and I have a lot of fun making them. I will keep making them until they tell me to stop! I hope everyone has a great week. My Aunt Diane, (my mother's only sister) and my cousin Rebecca, and her little boy Morgan, surprised us with a visit to Cleveland late Friday night. My aunt makes several trips here a year to visit my mom and the rest of the family, but Rebecca and her husband have not been here since my sister's wedding in 2000. This past Saturday was the first time that all four of my Nonnie's great grandchildren were together. 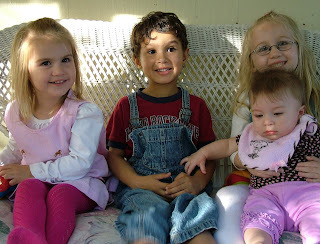 Alexa and Fiona are on the ends, Morgan is in the middle, and Giada is in Fiona's lap. This was taken on my parent's screened in back porch. The wheather was beautiful and the girls and Morgan played all day long. They all got along so well, no one fought, or cried or whined. My grandmother would've been tickled to death to have been there. I know she was watching and grinning from ear to ear. 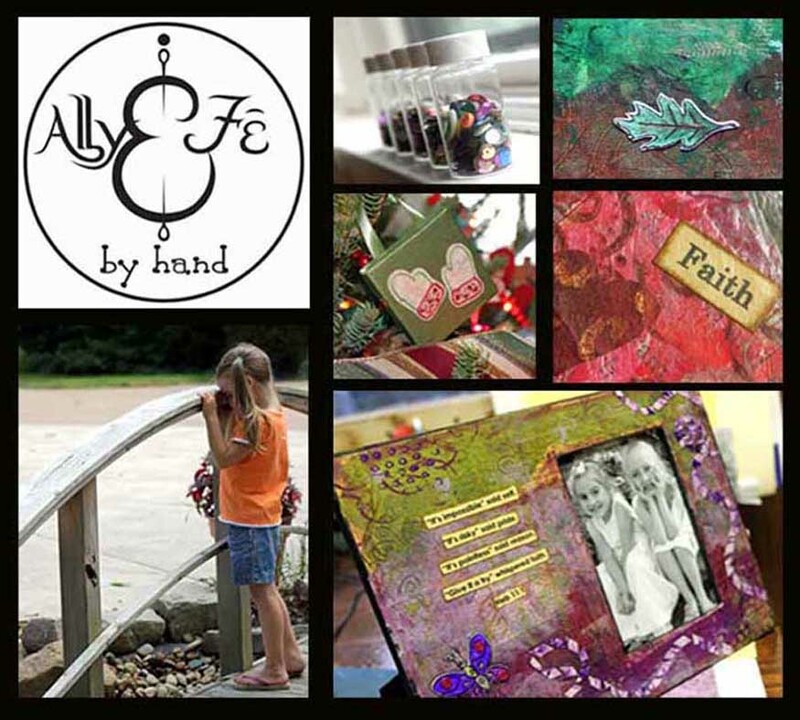 My sister's mother-n-law loves to shop garage sales and church sales. Being that she is retired, she has lots of time to look for good stuff. Last weekend, at our Halloween camp out, she presented me with two bags full of embroidery floss! A total of 105 skeins! I was like a little kid who got an early Christmas present. Later that night, while the girls slept next to me in the camper, I sat with a little flashlight and went through all those wonderful skeins of floss. 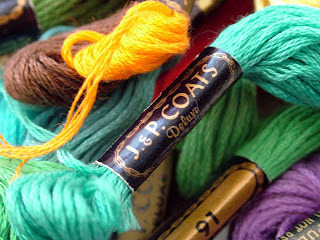 Most of them are J & P Coats deluxe. (Also DMC and a French brand) Now I am not positive, but I believe J & P Coats is now Coats and Clark. I'm not sure how old any of it is but it is all wonderful! 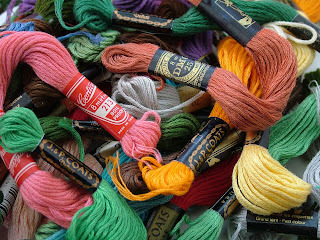 I am currently starting a Black work project that I am using the turquoise thread for. I will show pictures in a few days. I also have finished a small project for my cousin Rebecca. I am framing it tonight and will take pictures of it before I mail it to Oklahoma tomorrow. Have a great week. When Fiona was two years old, we were camping with my parents one fall weekend. It was time for bed and dark, my mother was coming across the campsite and approaching the camper door when Fiona got scared. She thought something was coming up to the door but she didn't know what it was. When my mother opened the door Fiona yelled "It's not a monster it's just Grandma!" I made this embroidery for my mother in honor of that occasion. We had a great time on our Halloween camp out. All of the camp sites were decorated, trails were lit with jack-o-lanterns, and everyone dressed up. I hope everyone has a wonderful week! 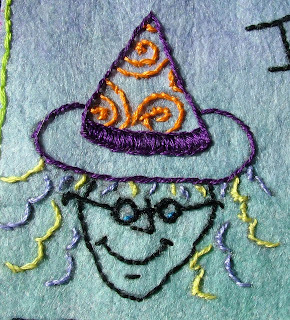 I love witches at Halloween. 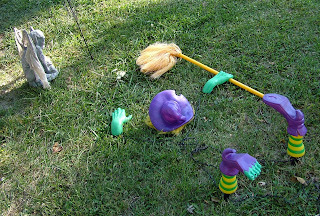 The first one is a lawn ornament that depicts a witch who has crash landed and plowed into the ground! It's hysterical! At night it lights up and her back legs move like she is trying to get up. 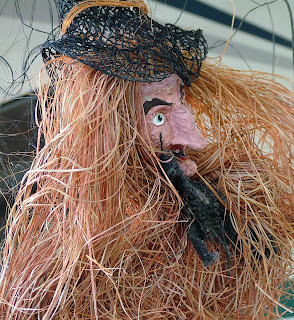 The paper mache witch is one my mother bought at a craft festival a number of years ago. If I had not been paying so much attention to the girls, I would have taken many more pictures of witches. This is Daisy, our stray cat. She had kittens in our garage in June, and about two weeks after that we moved her and her brood of four into our back office. Andrew installed a cat door so she could still come and go. (We weren't really sure how things would work out with her and the dog but we knew she and the kittens couldn't stay in the garage.) 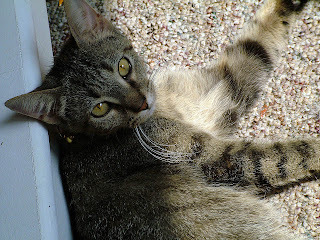 The kittens were taken to a no kill shelter in August and Daisy has taken up permanent residence in our home. She still comes and goes but sleeps indoors in her favorite chair every night and enjoys lying in the sunbeams in the back play room. 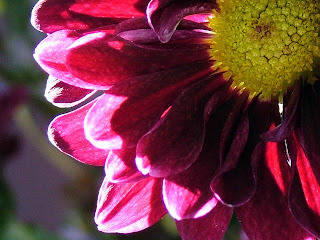 In appreciation for the home, love and food, Daisy will upon occasion bring us gifts. On Monday, that gift was a very much alive chipmunk that she proudly dropped on the living room floor! Upon which the chipmunk made a mad dash under the couch. Fiona and I both screamed (thank goodness Alexa was upstairs taking a nap) and Hailey decided she was going to start trying to retrieve it. Unfortunately for the little chipmunk, Hailey's hunter instincts kicked in and she got to the chipmunk before I could. Daisy couldn't understand what all of the excitement was about and was a little offended that we didn't enjoy her gift more. I have been frantically getting things done for our Halloween camp out this weekend at my parent's camper. The campground has a big Halloween event the first weekend in October with trick or treating, hay rides, haunted camp sites and decoration contests. I will take lots of pictures and post everything by Monday! 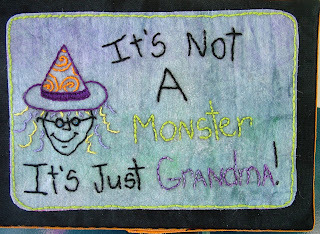 I have also just completed a small Halloween embroidery for my mother to display at the camper. I will have pictures of that too! Please excuse the lateness of this post and I hope you all have a great weekend. The girls and I were at Shoeple Gardens about two weeks ago and I took this picture while they were playing in the children's garden. 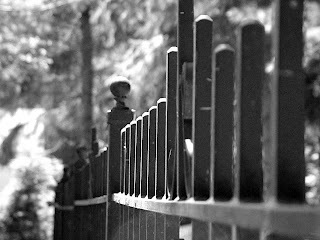 This is the wrought iron fence that surrounds the play area. I used the Macro function on my camera and set my aperture to about 3.2 I changed it to black and white in Photo Shop. I like the way you can't tell what year it was taken. It could just as easily have been taken a hundred years ago. This garden is one of the best places to take all kinds of pictures.